Representing plaintiffs and defendants with respect to patent, copyright, trade secret, trademark, trade dress, product configuration, unfair competition, and licensing claims. Calfee’s intellectual property litigators work with clients to protect their investments in ideas. Serving a broad spectrum of public and privately held companies, our attorneys represent plaintiffs and defendants with respect to patent, copyright, trade secret, trademark, trade dress, product configuration, unfair competition, and licensing claims. Our attorneys focus on all major scientific disciplines including mechanical, electrical and chemical engineering; chemistry; biotechnology; computer hardware, software and circuit design; semiconductors; and architecture. The litigators in our Intellectual Property group have gained extensive and valuable intellectual property litigation experience dating back to the 1980s when the group was formed. At any time, Calfee has 20+ attorneys devoting all or a substantial amount of their time to intellectual property litigation. Calfee’s IP litigators also are supported by and can draw upon the sophisticated case management technology and personnel of Calfee’s extensive general litigation practice if needed. Our intellectual property litigators have represented clients in matters before the USPTO, federal and state courts in many of the 50 states, as well as matters involving the U.S. Customs Office, International Trade Commission and Federal Trade Commission. Our attorneys have briefed and argued cases to the Court of Appeals for the Federal Circuit and other appellate courts. Many of these matters were for clients whose patent or trademark portfolio also is maintained by Calfee. Additionally, understanding that intellectual property litigation can be very expensive, the litigators in our Intellectual Property group advise our clients as to the full range of alternatives for resolving intellectual property disputes including licensing, cross-licensing or joint venture negotiations, specialized proceedings in the USPTO called “IPRs,” alternative dispute resolution proceedings, and litigation in federal and state courts. For well over a decade, our Intellectual Property group has been ranked in Band 2 and recognized by Chambers USA: America’s Leading Lawyers for Business, an industry-leading legal resource for professionals in search of qualified, experienced legal counsel. 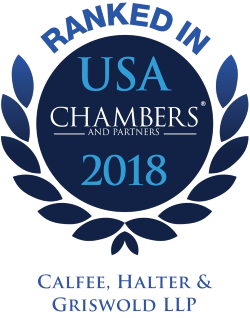 Most recently, in 2018, Chambers USA researchers report our group is held in "very high regard" by fellow practitioners who note our extensive experience representing clients in wider patent and trademark matters, IP litigation matters, appellate work, and advising companies on managing IP assets in China. Additionally, our IP Practice Group Chair, John Cipolla, is one of the highest-ranked IP attorneys (Band 2) in Ohio and multiple individual attorneys in Calfee’s IP group are also highly ranked. Consistent for the past 10+ years, our Litigation group and individual litigation attorneys have been ranked and recognized by Chambers USA: America's Leading Lawyers for Business, an industry-leading legal resource for professionals in search of qualified, experienced legal counsel. Calfee was selected for inclusion in the 2019 "Best Law Firms" rankings by U.S.News –Best Lawyers in America in Intellectual Property Litigation (national and metropolitan rankings).